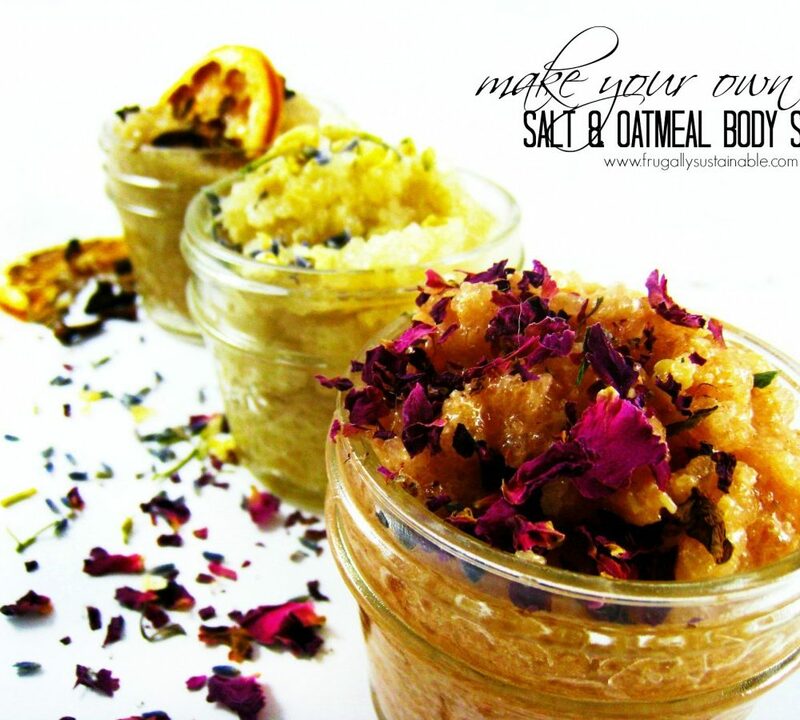 …this handcrafted salt & oatmeal body scrub! There’s a jar of the scrub by the sink and a jar in the shower. My skin is rejoicing! So much so, it’s literally glowing. Not to mention, coming in and washing up from my daily ranch chores, the grime and dirt come right off and my hands have never felt so soft! Are you ready to make some? *This is where it’s time to get creative folks! In a double boiler or small sauce pan, heat shea butter and oil until melted and well combined. Remove from heat and set aside to cool. Using a blender or food processor, pulse salts and oats to desired texture. Note: This can also be done by hand using a mortar and pestle. In a medium-sized bowl, combine salts, oats, shea butter, oil, honey, vitamin C powder, and vitamin E oil. Using a wire whisk, stir well to blend. Add optional ingredients if using. Spoon into storage container. Note: This recipe will fill 3-4 four-ounce glass mason jars. Will maintain freshness for 6-8 months. Using your fingers, scoop out a small amount into the palm of your hand and rub into your skin in a circular motion to remove dead skin cells. Rinse off with warm water and pat dry. 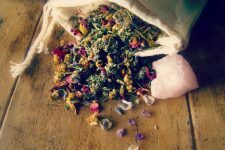 –Mountain Rose Herbs…they have everything you’ll need by way of Bulk Herbs, Organic Oils & Essential Oils, and Natural Products for Healthy, Natural Living! It’s your one-stop-shop! Health doesn’t come from plastic bottles. Vitality grows naturally from the way you live your life. If you want to learn more about herbs as medicine and as food, and if you’re just too busy to enroll in an in-person program, join the Herbal Academy of New England for a comprehensive and convenient online herbal course you can complete anywhere and anytime! Sounds great, but we have a septic tank and I fear that putting salt down the drain would be disastrous. I can’t wait to try this scrub. In the last year I have really gotten into using Salt Scrubs. 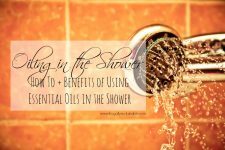 I absolutely love the way it makes my skin feel and after you rinse the salt off & get out of the shower to towel dry, you don’t even have to moisturize because the oils in the salt scrub are still on your body!! It’s one of the best things I’ve done for my skin in a very long time. Also, to the comment from Gail about salt going down the drain with a septic tank. Gail, we also have a septic tank and I use the salt scrubs all the time. The salt practically melts off your body when it’s washing down the drain. Not to say it would never happen, because I’m not an expert, but so far I have not had any, or noticed any, adverse effects to my septic system. 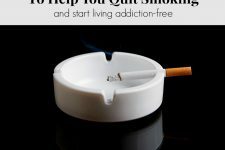 Hope that reassures you! Just curious-what does the vitamin C do? Does it keep it fresh? Could I use lemon juice if I don’t have the crystals? Thanks! Which grain of salt do you use, fine or course? Normally you do not want to use salt granules on you skin , except feet , too sharp for soft skin . However , crushing the salts up as in this recipe is Great !!! Love it and can’t wait to give it a whirl !!! Hi, would it be possible to substitute the oats for coconut milk powder?